Heat One: 1st S15 Aidan Hall; 2nd V22 Terry Rankin; 3rd Q7 Robbie Farr; 4th N78 Andrew Wright; 5th N47 Marcus Dumesny; 6th V98 Peter Doukas; 7th S78 Keke Falland; 8th N99 Carson Macedo; 9th N65 Brendan Rallings; 10th V58 Rhiannon Burleigh; 11th S96 Brendan Guerin; 12th W22 Brodie Minchin. Heat Two: 1st W14 Jason Pryde; 2nd N92 Sam Walsh; 3rd V55 Brooke Tatnell; 4th V37 Grant Anderson; 5th V68 Brett Milburn; 6th N43 Alex Orr; 7th N56 Mick Saller; 8th W97 Mitch Wormall; 9th N27 Kyle Angel; 10th D22 Leigh Mugavin; 11th V42 Jye O’Keeffe; 12th NQ5 Danny Reidy. Heat Three: 1st V17 Dennis Jones; 2nd V7 Paul Solomon; 3rd Q59 Kevin Titman; 4th NS4 Max Johnston; 5th S24 Ricky Maiolo; 6th S81 Luke Dillon; 7th V77 Brayden Parr; 8th V56 James Aranyosi; 9th S4 Lisa Walker; 10th V32 Stephen Spark; 11th N15 Matt Thomas; 12th DQ’d USA71 Gio Scelzi. Heat Four: 1st N48 Jackson Delamont; 2nd V70 John Vogels; 3rd W80 James Inglis; 4th S27 Daniel Pestka; 5th S97 Matt Egel; 6th W2 Kerry Madsen; 7th V60 Jordyn Charge; 8th T62 Tate Frost; 9th Q54 Randy Morgan; 10th NT24 Jamie O’Neill; 11th VA92 Rob Trewartha. Heat Five: 1st N49 Ian Madsen; 2nd T22 Jock Goodyer; 3rd W26 Cory Eliason; 4th V64 David Aldersley; 5th V34 Brenten Farrer; 6th Q23 Lachlan McHugh; 7th S13 Brock Hallett; 8th S63 Ryan Jones; 9th VA81 Rhys Baxter; 10th N83 Peter O’Neill; 11th V89 Jamie Heyen. Heat Six: 1st V40 Rusty Hickman; 2nd V73 Charles Hunter; 3rd W17 James McFadden; 4th VA6 Tim Kaeding; 5th V28 Andrew Hughes; 6th T25 Jamie Bricknell; 7th VA29 Jayden Peacock; 8th N53 Jessie Attard; 9th VA88 Grant Stansfield; 10th V12 Kristy Ellis. Heat Seven: 1st V8 Bobby Daly; 2nd N57 Mathew Dumesny; 3rd V35 Jamie Veal; 4th S19 Brad Keller; 5th V25 Jack Lee; 6th S44 Daniel Evans; 7th D2 Ben Atkinson; 8th V53 Andrew Thompson; 9th USA12 Parker Price-Miller; 10th N40 Chris McInerney. Heat Eight: 1st V52 Darren Mollenoyux; 2nd V72 Jacob Smith; 3rd T7 Tim Hutchins; 4th V67 Luke Walker; 5th V44 Tim Van Ginneken; 6th Q83 Steven Lines; 7th V5 Max Dumesny; 8th N10 Luke Stirton; 9th VA19 Daniel Newnham; 10th V50 Darren Clarke. Sprintcar D-Main (10 Laps): 1st V56 James Aranyosi; 2nd V89 Jamie Heyen; 3rd NT24 Jamie O’Neill; 4th W22 Brodie Minchin; 5th N27 Kyle Angel; 6th N15 Matt Thomas; 7th D22 Leigh Mugavin; 8th V58 Rhiannon Burleigh. C-Main 1 (15 Laps): 1st N53 Jessie Attard; 2nd V5 Max Dumesny; 3rd V72 Jacob Smith; 4th S44 Daniel Evans; 5th V64 David Aldersley; 6th N40 Chris McInerney; 7th N10 Luke Stirton; 8th V50 Darren Clarke; 9th VA19 Daniel Newnham; 10th N83 Peter O’Neill; 11th V56 James Aranyosi; 12th V12 Kristy Ellis; 13th V53 Andrew Thompson; 14th VA29 Jayden Peacock; 15th NT24 Jamie O’Neill; 16th VA81 Rhys Baxter; 17th V28 Andrew Hughes. C-Main 2 (15 Laps): 1st V98 Peter Doukas; 2nd V17 Dennis Jones; 3rd V7 Paul Solomon; 4th V42 Jye O’Keeffe; 5th V68 Brett Milburn; 6th T62 Tate Frost; 7th NQ5 Danny Reidy; 8th N56 Mick Saller; 9th USA71 Gio Scelzi; 10th N43 Alex Orr; 11th S4 Lisa Walker; 12th S96 Brendan Guerin; 13th V89 Jamie Heyen; 14th VA92 Rob Trewartha; 15th N65 Brendan Rallings; 16th Q54 Randy Morgan; 17th W22 Brodie Minchin; 18th V32 Stephen Spark. 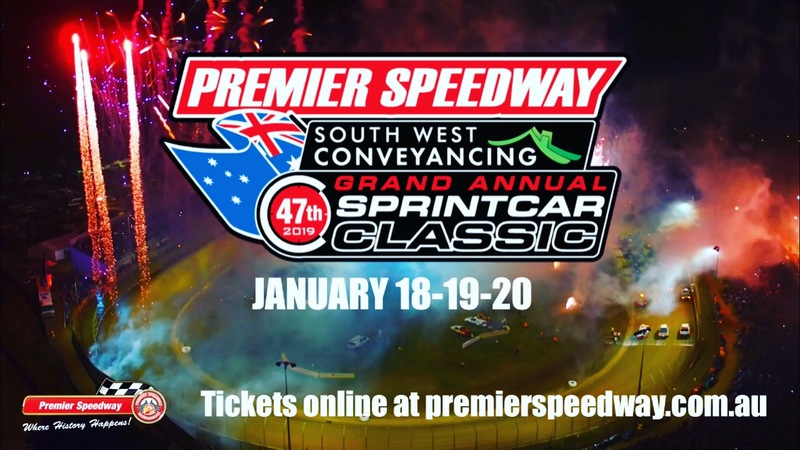 Sprintcar B-Main 1 (20 Laps): 1st T22 Jock Goodyer; 2nd S19 Brad Keller; 3rd S63 Ryan Jones; 4th V44 Tim Van Ginneken; 5th Q23 Lachlan McHugh; 6th V25 Jack Lee; 7th V73 Charles Hunter; 8th V34 Brenten Farrer; 9th T7 Tim Hutchins; 10th N49 Ian Madsen; 11th S13 Brock Hallett; 12th V40 Rusty Hickman; 13th N53 Jessie Attard; 14th USA12 Parker Price-Miller; 15th VA88 Grant Stansfield; 16th V8 Bobby Daly; 17th S44 Daniel Evans; 18th V72 Jacob Smith; 19th N57 Mathew Dumesny. Sprintcar B-Main 2 (20 Laps): 1st V77 Brayden Parr; 2nd N92 Sam Walsh; 3rd V22 Terry Rankin; 4th V60 Jordyn Charge; 5th S78 Keke Falland; 6th V70 John Vogels; 7th W80 James Inglis; 8th Q59 Kevin Titman; 9th N78 Andrew Wright; 10th W14 Jason Pryde; 11th V98 Peter Doukas; 12th W97 Mitch Wormall; 13th N48 Jackson Delamont; 14th V17 Dennis Jones; 15th N47 Marcus Dumesny; 16th S24 Ricky Maiolo; 17th V7 Paul Solomon; 18th V42 Jye O’Keeffe; 19th S15 Aidan Hall; 20th S27 Daniel Pestka. Sprintcar A-Main (40 laps No Time): 1st Q7 Robbie Farr; 2nd V35 Jamie Veal; 3rd W2 Kerry Madsen; 4th V55 Brooke Tatnell; 5th W17 James McFadden; 6th V37 Grant Anderson; 7th V67 Luke Walker; 8th S97 Matt Egel; 9th T25 Jamie Bricknell; 10th VA6 Tim Kaeding; 11th N99 Carson Macedo; 12th V60 Jordyn Charge; 13th S19 Brad Keller; 14th N92 Sam Walsh; 15th V52 Darren Mollenoyux; 16th S81 Luke Dillon; 17th V22 Terry Rankin; 18th T22 Jock Goodyer; 19th V44 Tim Van Ginneken; 20th NS4 Max Johnston; 21st V77 Brayden Parr; 22nd Q83 Steven Lines; 23rd W26 Cory Eliason; 24th S63 Ryan Jones. (Start Order: 1. W26; 2. V55; 3. V35; 4. Q7; 5. V67; 6. V37; 7. W17; 8. S81; 9. T25; 10. W2; 11. V52; 12. N99; 13. VA6; 14. S97; 15. Q83; 16. NS4; 17. T22; 18. V77; 19. S19; 20. N92; 21. S63; 22. T22; 23. V44; 24. V60). Lap Leaders: 1-10 W26 Cory Eliason; 11-40 Q7 Robbie Farr.